Special features: The name admiral is a corruption of the word admirable which refers to its admirable bright colours. 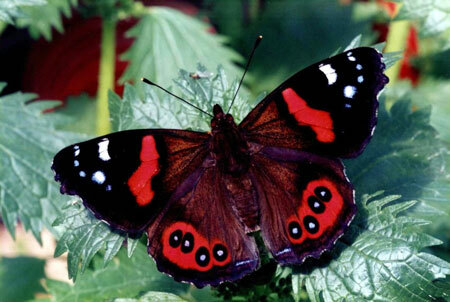 Most red admirals seen in the UK arrive here in the spring after flying north from Southern Europe. Although some successfully hibernate here throughout the winter, most do not survive the cold weather. The May arrivals lay their eggs singly, on the upper surface of stinging nettle leaves. By the middle of summer a whole new generation of red admirals will be on the wing. In autumn many fly south to return to Southern Europe. Habitat: Gardens, Hedgerows and meadows. Food: Nectar, loves buddleia and will also feed on windfall fruits such as apples and plums.